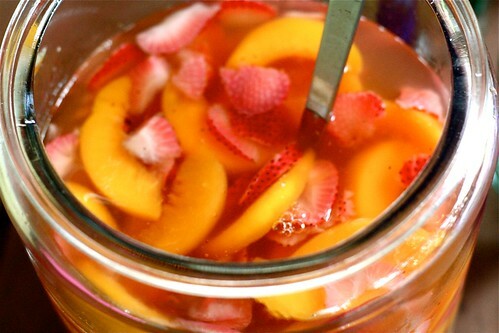 Throw all the fruit in bottom of a large pitcher or punch bowl and sprinkle with 2 tablespoons of sugar. Pour 1/2 cup white rum on top of the fruit and let it sit for about an hour. Pour the big bottle of white wine in there with about 2 cups of white grape juice. Add more sugar if you need it. Stir, add ice cubes and chill.